How to use a circular gauge control as a circular progress bar? This article explains you to design a circular progress bar using Circular Gauge. Circular Gauge can be used as circular progress bar for various scenarios and control can be customized accordingly. The following screenshot displays the circular progress bar using circular gauge. In this article, three gauges are added in a layout each can be used for different scenarios. Circular gauge for finding percentage of Shareholders in a company. Range Pointers can be used to know the percentage of Share Holders available. Add headers to add percentage value of shareholders, since header can be positioned as required. 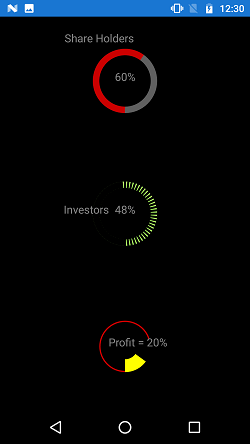 Add RangePointer in order to highlight the Investors percentage from Total. Finally, Add header to indicate percentage value of Investors, since header can be positioned as required. Ranges can be added to circular gauge, by which levels of progress can be differentiated using different colors. Add Header, to know the profit percentage, using header the position can be altered as required. Finally, add all the three circular gauge in layout and set content as that layout. his page would be much more powerful if the picture was shown at the top and the images were broken up into 3 seperate images with corresponding code below. This page currently appears as a big block of code to most users who don't scroll to the very bottom for the payoff. I'm excited to see that the ability to create a circular progress bar exists. I think you should highlight it as the feature over the circular gauge as there are more apps that use the circular progress bar over gauges. Keep up the good work, Syncfusion!